We love to share information about our farming practices and invite you to enjoy a tour of Kilgus Farmstead! Come and see for yourself how we care for our animals, steward the land, and create our high quality products. Our goal is to provide you with a better understanding of where your food comes from and how a working farm operates. Each tour is given by a Kilgus family member, so tour dates are limited by our family availability. Please see available tour dates below and book a Kilgus Farmstead tour by using our booking form. We welcome any size group, large or small, and each tour will be catered toward the group’s interests. 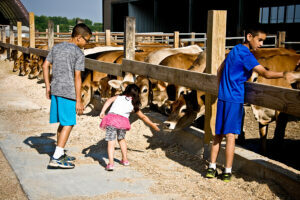 Tours are $4/person (ages 2 and under are free); which also includes an ice cream cone from our farmstead store! Learn about the Kilgus Family and how we care for our animals. 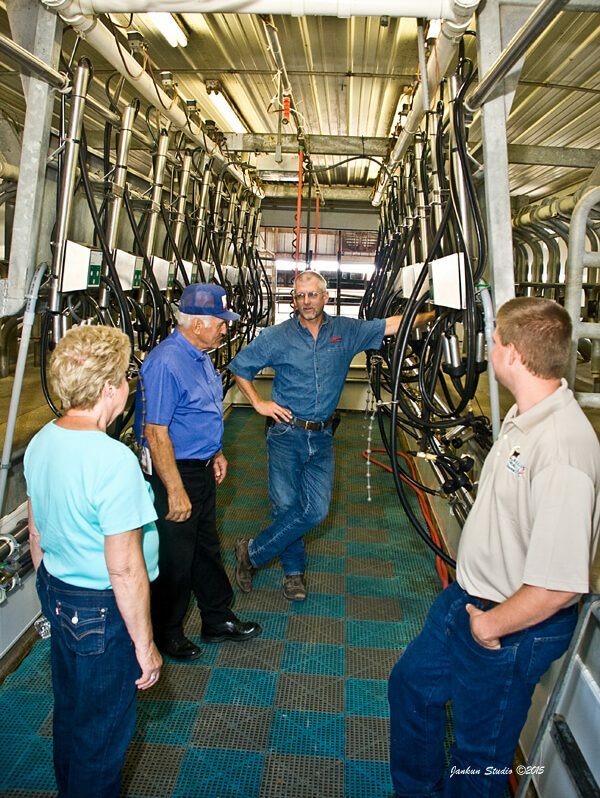 Visit our milking parlor and learn how the cows give us their rich milk. Meet our Jersey heifers and steers, as well as our Berkshire hogs. View our new compost barn and learn about its importance on the farm. Visit our Farmstead Country Store, where you can look through our viewing window into the creamery where our milk is bottled, shop for a variety of local products including our own, and enjoy a delicious soft-serve ice cream cone! Tours will begin and end at the Kilgus Farmstead Country Store and will typically last 60-75 minutes depending on the size of your group. We ask that you arrive 10-15 minutes before the beginning of the tour, as we will begin promptly at the scheduled start time and head immediately outside to the animals. We will be outside for most of the tour, so please dress appropriately for the weather. If it is raining (or has rained recently), you should expect mud. It is a good idea to wear old, closed toed shoes on the farm in any weather. No payment is required to reserve your tour. Payment for the tour should be made at the end of the tour in the Country Store. Please note that we only accept cash and personal checks. If you are unable to make it to your tour, please let us know as far in advance as possible (at least 24 hours) so we can offer your spot to someone else. We may cancel tours due to inclement weather. When reserving your tour time slot, please give an emergency contact phone number and also an email address in case we need to cancel or change the tour for any reason. Tours on the dates below are limited to 15-20 individuals. If you have a group larger than 12 or are a club, organization, or school group that would like a tour, please contact us for additional dates and times. Please remember that the Farmstead is also our home. While we love sharing about ourselves and our animals, when you tour our farmstead you are also guests at our home. Please keep this in mind and be respectful of our family, our property, and our animals – as you would as a guest at someone else’s home. These dates are tentative based on family availability; until a tour time has been personally booked, these dates and times are subject to change. Tour times fill up fast, so please book well in advance to reserve your spot! * Tours are not given in December, January, February, or early March. Does your group consist of more than 12 people? 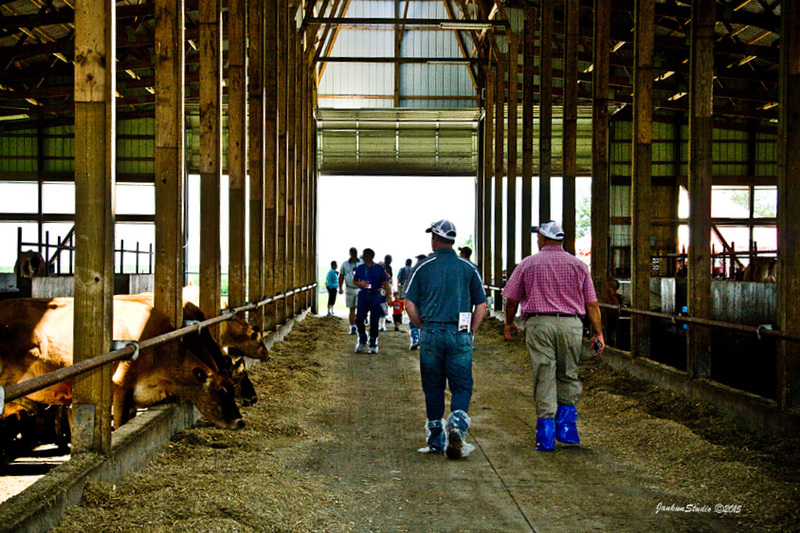 Which of our pre-scheduled tour dates and times work best for you to tour our farmstead? If you would like to bring a large group to the farm (more than 12 people), please list additional days/times that your group is interested in.